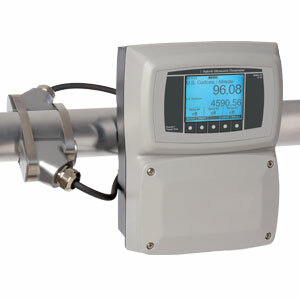 Find how a Ultrasonic flow meter works on this link. Display Volume Units: Independently configurable rate and total display units in U.S. Gallons, ounces, barrels (US liquid), barrels (US oil), cubic ft, acre ft, Imperial (British) gallons, liter, cubic meter, or user defined “custom” units. Rate display in feet or meters per second. Data Logging: Date/time stamped flow rate and flow total data in FAT32 file format, easily imported into Excel. Configurable to trigger on time interval (1-999,999 sec), rate and/or total set-point values. Over 500,000 log events possible with included 32 MB SD card. Process Control Options Any FDH-1 model can be equipped with a process control relay package (-R3) that includes three independently programmable 10 A relays. Each relay can be configured to respond to changes in either the measured rate of flow or the accumulated total flow value. When assigned to monitor flow rate, high/low/ range rate alarms are possible. When assigned to monitor accumulated total, manual trigger batch operations or automatically triggered, timed batch (proportional feed) operations are possible. Note: Comes complete with mounting hardware, stainless steal clamps, and operator’s manual. For a 5-point NIST calibration, add suffix "-NIST" to the part number, add one week to the lead time; and contact sales for additional cost.